Are you in the market for some new drones? Even if you're not, Parrot's new releases are still worth taking a look at. Parrot, maker of various wireless products and drones, has released two new models - the Parrot Swing and Parrot Mambo. 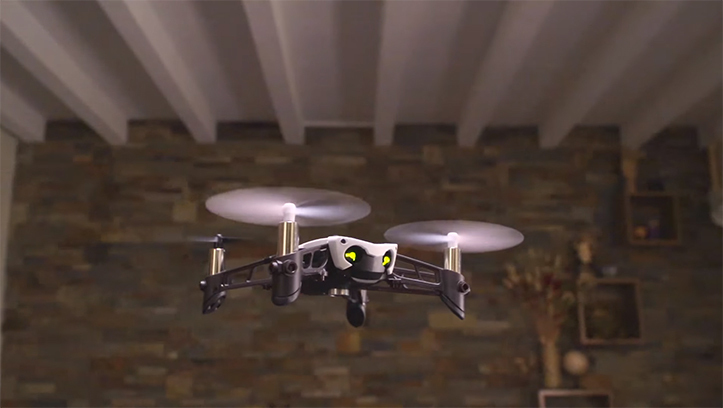 The Parrot Mambo is close to your typical quadcopter drone, but with a few extra goodies. You can attach a cannon to the top of the Mambo to take down your friends' drones, try to aim the balls into a goal, or continuously fire the balls at the back of your friend's head. If firing tiny balls isn't your thing, you can also attach a grabber arm to the bottom of the Mambo. With the arm, the drone can pick up objects up to four grams, which translates to about four paper clips. The power to shoot tiny balls at your friends and carry paper clips can be yours for the low price of $119.99. What flies like a plane, controls like a quadricopter, and looks like an X-Wing Fighter? Parrot's other new drone, the Parrot Swing! The Swing is definitely the more unique of the two drones, capable of flying vertically and horizontally. The Swing takes off the ground like a quadrocopter, then the tiny propellers turn on their sides to propel the drone forwards. The Swing can even reach 18 mph, and perform loops and flips in-air. The Parrot Swing will set you back $139.99. Both drones also feature cameras, albeit only at VGA resolution. They can be controlled with Android devices using their FreeFlight Mini application linked below.